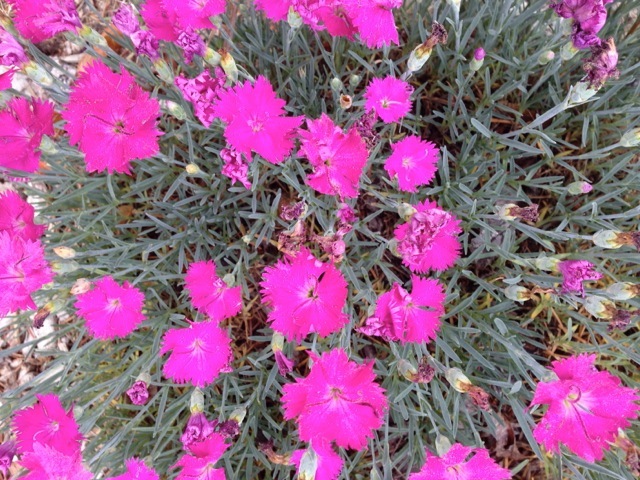 Every year Firewitch dianthus grows. Return of paperwasps and swallows. Then blooms open, greeting old friends. A cup of nectar at their feet. Toads emerge from their long sleep. Crescendo in the cottage border. Wonderful name and colour to wear….. So pretty! Giving beauty and breathing life to nature and how they are all interdependent.bees chatting, tasting nectar.olive how you write! Hope you’re feeling better. Sweet words for a sweet flower. Beautiful description with lovely dancing words. Wow, I never knew the name if this flower. They are so pretty. Thanks – I know now!!!!! Oh, you tweet? How lovely. I am tempted to now and then, but somehow I haven’t taken the step. You, too! It’s related to a carnation, I’ve discovered. I love the line “pink stars fallen to Earth.” It’s such a wonderful image! Thanks, Amy! 🙂 Have a magical day!